In the Era of Good Feelings the U.S. had a "One Party System" - Fact or Myth? For a brief moment during the era of Good Feelings the U.S. had a one-party system. Some claim there was a “one-party system” for a brief moment in the Era of Good Feelings under Monroe and the Democratic-Republicans, but that isn’t fully true. There was still Federalist opposition in those years. That opposition would go onto become the National Republicans, Whigs, and then Republicans. In other words, there wasn’t literally a one-party system in the Era of Good Feelings, instead there was a lot of unity from the end of the War of 1812 in 1815 until around 1820 and there was very little Federalist activity during Monroe’s Presidency. With that said, the lack of Federalist activity isn’t purely a matter of Monroe being great or the country being unified, the fact is Monroe purposefully and effectively blocked the weakened Federalist Party from government for his 8 years in office, thus creating a one-party system of sorts. The reality is that Monroe’s Era of Good Feelings wasn’t much different than what happened with Cleveland, Eisenhower, or Reagan (where a single party dominated parts of government and won many electoral votes). Below we tell the story of what actually happened. TIP: There was also a one party system of sorts during the Civil War, but this was because the Conservative Southern Democrats seceded and the Democratic Party stopped operating. The South also generally had a “one-party system” in many states. However, I can’t think of a time in history where there was literally one party (which is probably good for democracy; despite Washington, Madison, and Monroe’s hope we would eschew factions and party politics). In other words, there really has never been a one-party system in the United States of America, just like there has really never been a three-or-more party system, and there has instead almost always been a two-party system in America in any era (the eras of U.S. politics are also called “party systems,” which is a bit confusing; but those describe eras, not how many parties dominate government). The Era of Good Feelings (Story Time with Mr. Beat). 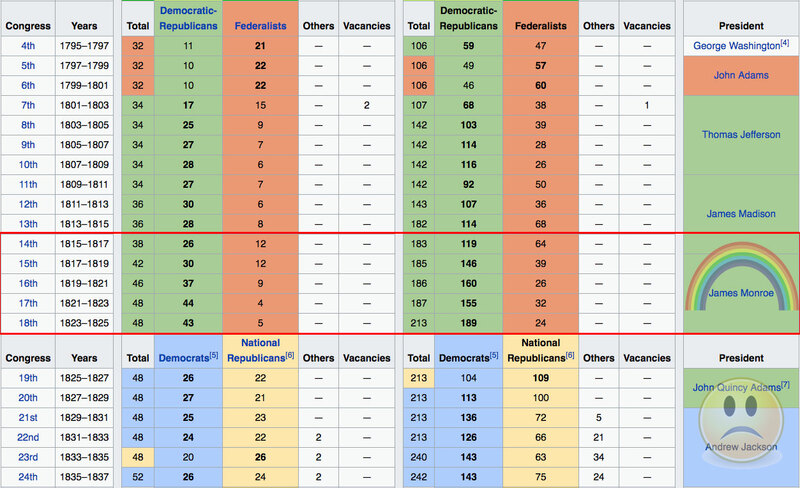 TIP: See Party divisions of United States Congresses over time, does that look united to you? The Federalists party dwindled in popularity after the War of 1812 (a war the Federalists didn’t support, which cost them dearly). In that same time, due to winning the war, due to the popularity of previous President Thomas Jefferson and 1815’s President James Madison, and due to a lack of a prominent opposition party, the feeling of national unity increased in the last year of James Madison’s presidency. Then, on the back of Madison and Jefferson (two of the countries most notable Presidents and leaders of the Democratic-Republicans) James Monroe, the last founding father to win an election, won the 1816 election with strong support. Monroe enjoyed a lot of support and the country enjoyed a bipartisan environment until the Panic of 1819 struck, and a dispute over the admission of Missouri embroiled the country in 1820. With that said, the wins for Monroe were a crushing defeat for the Federalists. In fact, Monroe’s 1816 election was the last nail in the coffin of the Federalist party in many respects. Despite this however, the Federalists never fully disbanded. Instead, after taking office, as noted above, Monroe blocked the remaining Federalists from government for the next 8 years out of a fear that they wanted a Monarch (which was probably a valid fear; the Federalists were generally more aristocratic in the old days). This isn’t to say there wasn’t a lot of unity and good feelings in those days in general, there was, but there was also a very real conservative opposition without much of a voice waiting in the background (an opposition that would resurface during the Jackson vs. Adams elections the second the Virginia dynasty died off). In other words, the Federalist party didn’t disband and join the Democratic-Republicans as much as Monroe blocked the remaining opposition in a time of unity while a few of the more liberal Federalists (like John Quincy Adams; who wrote the Monroe Doctrine) retained positions in government. Still, despite all this, the federalists retained seats in the Senate and House in this time. In fact, despite the general story being that “the Federalists disbanded in 1816,” the reality is the Federalists controlled parts of the country, including the Massachusetts Senate all the way up until 1830. TIP: This unifying nationalist spirit peaked in the election of 1820, which Monroe won in a landslide: 231 votes to his opponent John Quincy Adams’s one. The next elections were the Jackson vs. John Quincy Adams’s elections which plunged the Nation into a sort of partisan chaos filled with patronage and propaganda wars that remains to this day. I wouldn’t say the Era of Good Feelings is a lie, or totally reject the idea that there was a one-party system in that era, but at the end of the day… the same divisions that have always been there remained in that era. Essentially what happened was Monroe spent 8 years suppressing the federalists at a time when the federalist faction was weak and Democratic-Republicans like Jefferson, Madison, and Monroe were enjoying the national unity following the War of 1812.